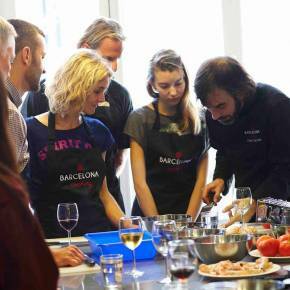 La Boqueria market tour and Spanish Cooking Class is our most popular offering. Together, the tour and the class take approximately four hours. 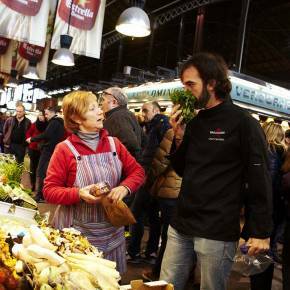 The tour starts with accompanying our chefs to the world famous La Boqueria market, located nearby. During this 'behind the scenes' guided tour, you will meet many vendors, some of whom have been there for generations. You will learn about locally grown products and participate in the selection of ingredients that will be used later in the cooking class. Upon returning to our kitchen, you will begin preparing the four course menu consisting of classic paella (on Mondays and Bank Holidays Chicken paella will be cooked), starter soup, appetizer and dessert, all of which you will enjoy. 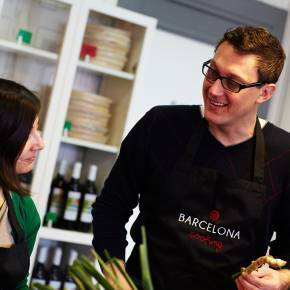 All our classes are taught by professionally trained bilingual Spanish chefs. The classes provide a fun, social, hands-on experience, where you will be participating in the preparation of the various dishes under the thoughtful guidance of our chef instructors. Our classes are designed for accomplished and novice cooks, and there are activities in the food preparation process for every skill level. 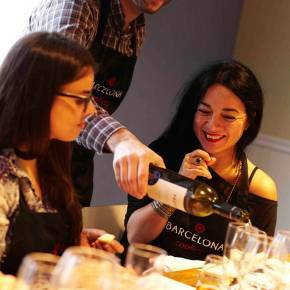 Our private label premium Rioja red and Galician white wines are served while you enjoy the meal you just prepared. All our menus can be adapted to accommodate any food restriction you may have. Please advise us beforehand so we plan accordingly. Please note that La Boqueria market is closed on national holidays. BOOK NOW GIFT Do you have a gift code?